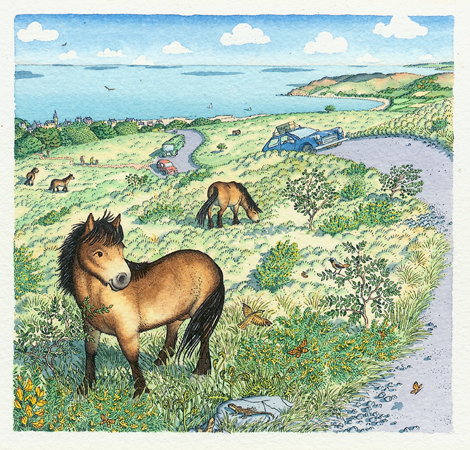 The delightful image at the head of this page, as well as those to the left and below, feature Pebble the Pony, a creation of Benedict Blathwayt who has written and illustrated many children's books. In the 1990s his books featuring Bramble the Cow sold over a million copies in Sainsburys. Benedict is part of a family that has long associations with the Porlock Manor Estate and today he lives in the West Country. The Porlock landscape is eveident in all these pictures. The one above shows the foreshore at Porlock Weir as it might have looked if the GWR had extended its branch from Minehead to Bossington and Porlock Weir. On the left is the famous toll road emerging above the tree line, so beloved of motor sport enthusiasts, while below Pebble is being led up the track through the wooded slopes high above Porlock Weir. If you have a piece of art that has been inspired by the Porlock area, please do send us a copy and we will consider adding it to this page. 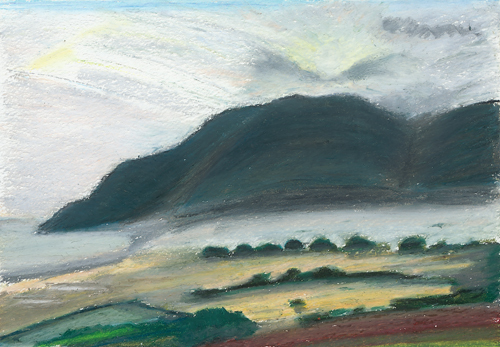 The changing moods of Porlock Bay are a source of continual inspiration to Mark Blathwayt, who captured the brooding shadows as the sun rises behind the great mass of Bossington Hill and Hurlstone Point (left).